View From a Loft invites you to send a photo of your creative (or not so creative tree) to viewfromaloft@yahoo.com. Terry was a long time LAPD Officer who took special interest in gang issues, and played a large part in the Community Policing Unit. He was a wealth of knowledge regarding the problems communities have; and he helped us immensly in ours. Officer Cammack was an outstanding man and he will be sadly missed. Funeral services for Officer Cammack will be held at: Calvary Chapel of Costa Mesa at 11am on Thursday December 21, 2006. 3800 S. Fairview Road, Santa Ana, CA. Internment services will be hald at: Pacific View Memorial, 3500 Pacific View Drive, Corona Del Mar. Daily News column from January, 2006 about officers fighting cancer. It may not be time to panic, protest or blog heavily about the new site between the Eastern Columbia Building and the Former May Co that already has a facade that looks out of place with the historic buildings on Broadway. In the meantime, for those who track old dowtown film locations, it's hallowed ground that's been covered in the earlier version of View From a Loft. Eric reports of his busy day downtown hitting Pershing Square, Weeneez and Metropolis Books and mentions opening day and the exhibit of photography on the walls of the bookstore (as noted here). Friday afternoon was a busy opening day for ribbon cutters around Main Street. Not only did Julie and Steve get the speeches and honors that afternoon, so did StellaDottir Fashion Design two doors down and Weeneez at 5th and Spring. All programs were tightly scheduled, so at one point you saw grown adults walking fast, if not running, with scissors on Main Street. Back at the Bookstore: The photography on exhibit of downtown's older building are by Bob Angell. a local with a studio near 8th and San Pedro. For the last 4 years, Angell has taken his large format 4X5 and Schneider lens to photograph buildings in the large format camera's "low current rather than the high voltage" of digital. Formerly one of the in-house freelance photographers for American Apparel, he really captured a stillness of the buildings around Main and Spring Street. It's on display until, as he put it, "the end of January or whenever." Despite the considerable enthusiasm filling the room, and a handsome German poster for Fritz Lang's "Metropolis" above the cash register, the space still looks a little bare. But Metropolis Books, at 440 S. Main St. — arriving at a time that sees far more closings than openings in the book business — is being called the first nonspecialty, nonchain bookstore in downtown L.A. since the legendary Fowler Brothers shut its doors in 1994. Grand Avenue has been the focus of much of downtown's development, and books can be bought at the gift shops of Walt Disney Concert Hall and the Museum of Contemporary Art. Used and specialty bookstores come and go. 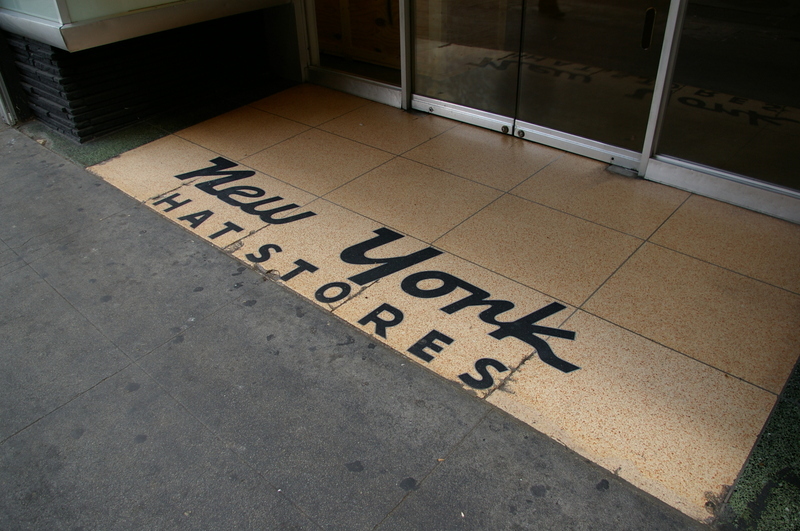 But despite downtown's residential boom — and the old bookstore row that filled 6th Street half a century ago — Metropolis is the first place for more than decade where a flâneur can stroll in and count on picking up a collection of classic Chekhov stories, the latest new-American cookbook and a new anthology of literary comics all in the same trip. "This is the kind of retail we need more of," said Brigham Yen, a young downtown resident and budding real estate mogul who was browsing while listening to an iPod. "I don't know if it's PC to say, but they're reclaiming the street for the residents who live here." There may be a few who can take part of the credit for getting this bookstore up and running, but it has to be noted, as Julie told me just now: "We picked up the keys on November 1 and opened December 1." For the first time, Homeboy's business units will be housed together with its administrative and programmatic services. 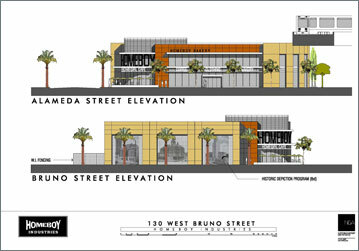 The re-opened Homeboy Bakery, Homegirl Cafe and Catering, Homeboy/Homegirl Merchandise and Retail shop will all be located in a single complex and under one roof. All Visitors, both clientele and community leaders, will be able to see and understand the full scope of Homeboy's work from the gang member waiting for Tattoo Removal services to the former gang member packaging breads in the Homeboy Bakery or selling merchandise in the Homeboy Merchandise Store. This will also serve as an undeniable testimony to both potential employers and the community-at-large that these young men and women are willing and able to be strong, productive members of the workforce. 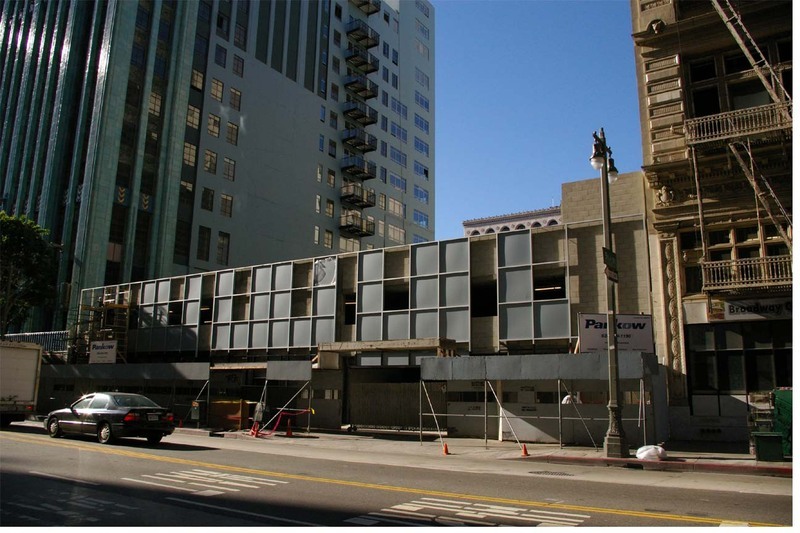 Also on the Off Ramp archive is Kevin Roderick who talks about the Wilshire Blvd temple; Bullocks Wilshire. 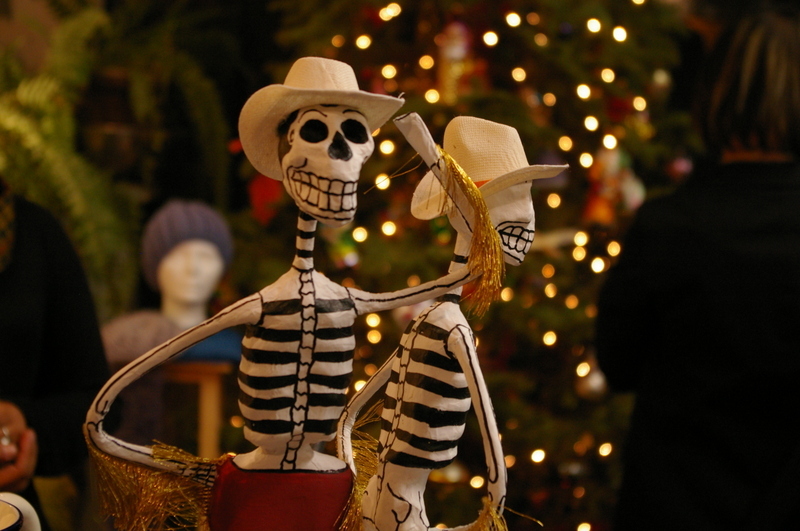 Day of the Dead Shopper: In Consulo Campos Arts District studio, these figures stand guard during her weekend long gift sale and party hosted by several artisians selling jewerly, paintings, soaps, and candles. Lily Lakich Traction Ave studio in the Arts District during her December 17 book signing of Lili Lakich: For Light For Love. The book is a pictorial memoir for this co-founder of the Museum of Neon Art (MONA) and covers her body of work that introduced neon art to the fine art world. The signing brought in a good crowd (most seem to be from the Westside), some of the collaborators of neon works, and a few who were subjects of the some of the neon sculptures. The cover of the 160 page book, that goes $45 dollar, is her signature piece neon work that is still used as the logo for MONA. Lakich is also graphic designer and the book itself reflects a beautiful look and style. Stories From Downtown to The Riv and back. BACK TO THE RIND II: "Picked by Hand" was introduced at it's new home in the Casa Blanca Library and Family Learning Center yesterday. As some of you may know, this was an art project that was sponsored by the Riverside Art Alliance, on behalf of the Riverside Art Museum and the Junior League of, yes...Riverside. The presentation went well...almost. As I was standing next to the piece about to speak, I touched the side and the cover came off, exposing the project ahead of time. I paused one beat and edited my opening line as "What you see here..." and went on. Afterwards, I was offered to choose an alternative site if I felt the lobby wasn't quite right. We all thought it was a bit cramped. I suggested the inside corner, next to the checkout desk, near the children's section where a bulletin board can be placed to add stories or memories and start a record of others who worked the groves and packing houses. It also just might make a good blog. 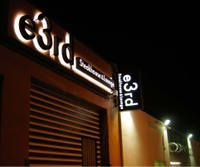 OPENING SOON is e3rd (East of 3rd). Jason Ya's new steakhouse two doors down from ZipFusion. 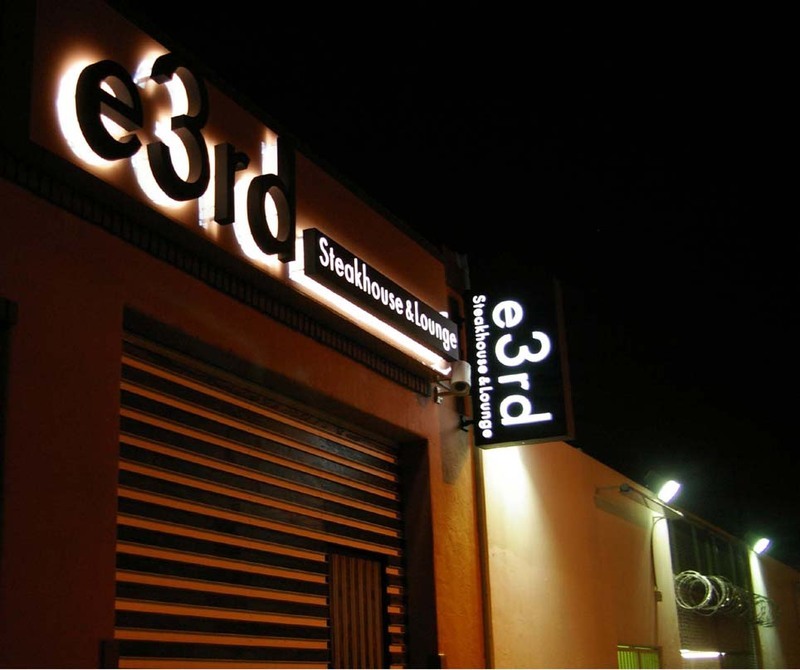 He arm-twisted locals and and plied with drinks last evening to taste test the menu. Yes, a sacrifice to help grow a community business, but that's what kind of neighbors we are. You will have to try the Spicy Pork Ribs. In addition to Asian Fusion style beef, pork and chicken, "American" ribeye and strip steaks will be served in a stunning warehouse space. It opens at the end of the month, permits permitting. NOW OPEN: Skid Row Adjacent Metropolis Books has a Grand Opening today at 2:30 pm (bring your own shopping cart.) Perry will preside at 3pm. Along with book signings this afternoon with mulitple authors, 4 years of capturing downtown urban scenes with a 4X5 large format camera is on exhibition as well. 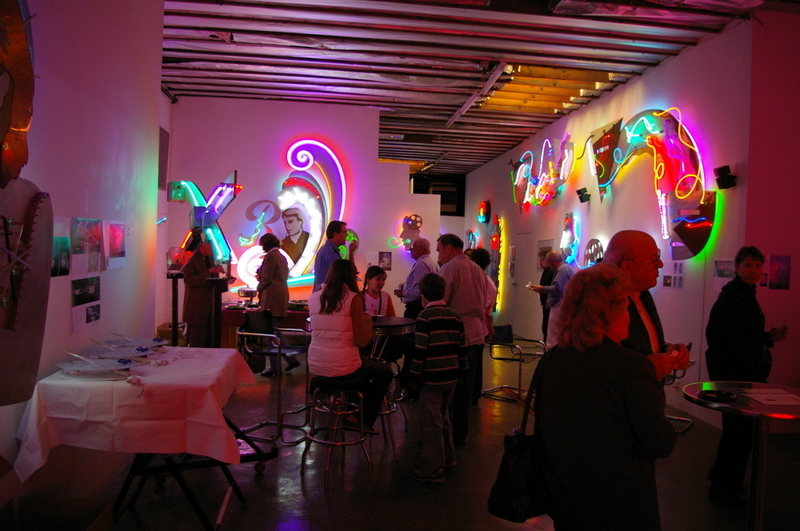 MORE LIT Arts District advocate and neon artist Lilly, who co-founded the now homeless MONA, has a new book on her neon sculptures. A RSVP book party is being held this weekend for "LAKICH: For Light. For Love. For Life" at the "scruffy" Traction Ave Studio. I'll have pics later. CAMERA: You have until February 11 to see "Ansel Adams at Manzaner" at the Japanese American National Museum (JANM) guest curated by Dr. Anne Hammond. The exhibition is a rare glimpse inside of the World War II camp that held Japanese/Americans and is also a look at social narrative by Adams, better known for his landscapes. STAR ON BROADW’Y: Sometimes the streets of Downtown plays itself, other times it stands in as “city of your choice”. You can see the Palace Theatre’s star as the “Detroit” Theater in the just released “Dreamgirls” OUT ON A LIMB Watch. Eddie Murphy will get a Best Actor Nom for his role as James “Thunder” Early. Some say its nothing but a rehash of his SNL's James Brown thang, but it's a little more than that. LIGHTS: Joseph Young’s Triforium is a public art pinata; each time the colored retro 1975 jukebox is mentioned, people take a whack at it. Arts District Resident Qathryn Brehm is credited for bringing it to the attention of Perry. The Q told us “The Triforium may be one of the oldest public art pieces in the City.” OLDER YET: At 445 South Figueroa is the modern sculpture, Aquarius by Jerome Kirk (1969). Double Ascension (1969) by Hebert Bayer is also a public art love-child of the 60s. Then there’s David Alfaro Siqueiro’s Tropical America (1934) at El Pueblo. EVEN OLDER YET is Pershing Square’s Spanish War Memorial (1900), the first public art from the City of LA. 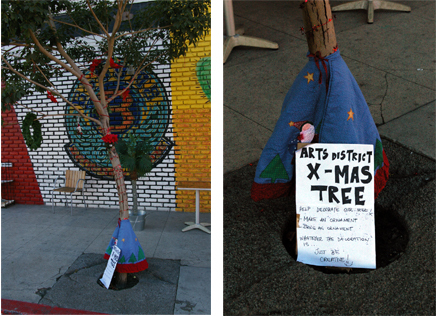 An interesting discussion is going on over at blogdowntown that started with a heated challenge to LA Observed. LAO strong belief that the current hole in the ground by AEG's LA Live will not start any form of a "bustling hub" to Downtown, as a Forest City developer claims. And LAO comments directly to blogdowntowns post.